This is a picture of the release cord for your garage door opener. A coat hanger inserted over the top of the door can hook this cord and when pulled can open the door. Securing your garage doors will cut your odds of being burglarized. 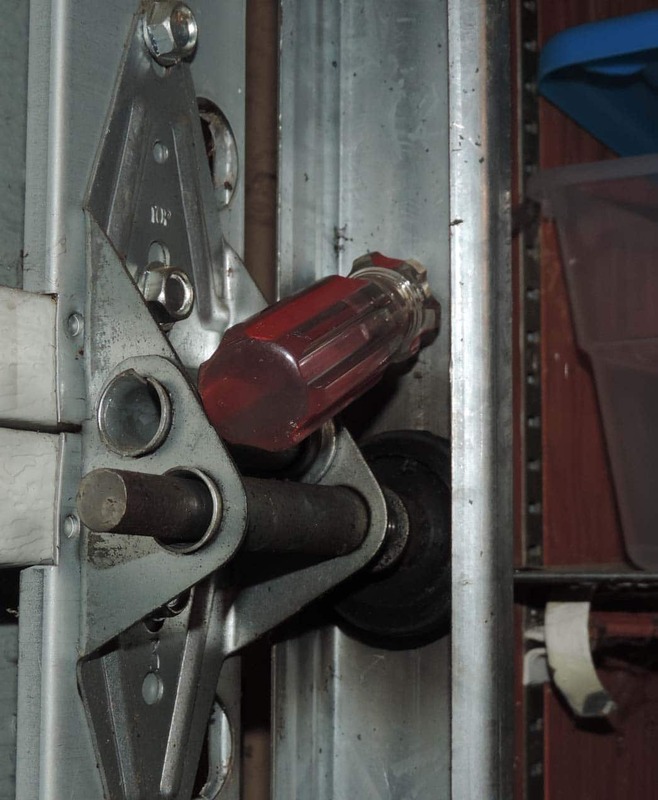 Yesterday, I wrote about the Zombie Bar Use the Zombie Bar to Secure Your Doors Against Burglaries and Home Invasions and how you could use one to secure your side or rear garage main doors. This is the main way that burglars enter a home. When they are inside your garage, they can take their time working on the door into the house, plus they have your tools to use. But what about securing your vehicle access doors? The first problem is that many of us use garage door openers. The new garage door openers use a rolling-code technology, where the remote will transmit a brand new security code each time you press your remote. There are over 100 billion codes. This is the best type of garage door opener. The older models came in two types, first the really old ones all came with basically the same codes. In other words, one code worked all. These are all over 40 years old or so. If you have one of these get rid of it. This is what the dipswitches in opener will look like. 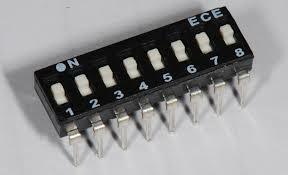 The next generation, came with dipswitches that you reset to make your own code. These worked ok, but many people just left them on the default code. You need to have your own code and change it if you have let anyone else have access to the opener. If yours have dipswitches, the back will open and you can see the switches. The manufacturer’s instructions will show you how. Don’t leave garage door openers where they are visible in a parked car, especially in your yard. They will break into the car and use the opener to gain access. The arrow points to the small cable tie that keeps the cord from being pulled and opening the door. Overhead doors with door openers come with a built in security problem. They have a release handle on the chain between the door and the opener. Burglars can take a coat hanger and reach in at the top of the door and trip it. Then all they have to do it lift up the door. 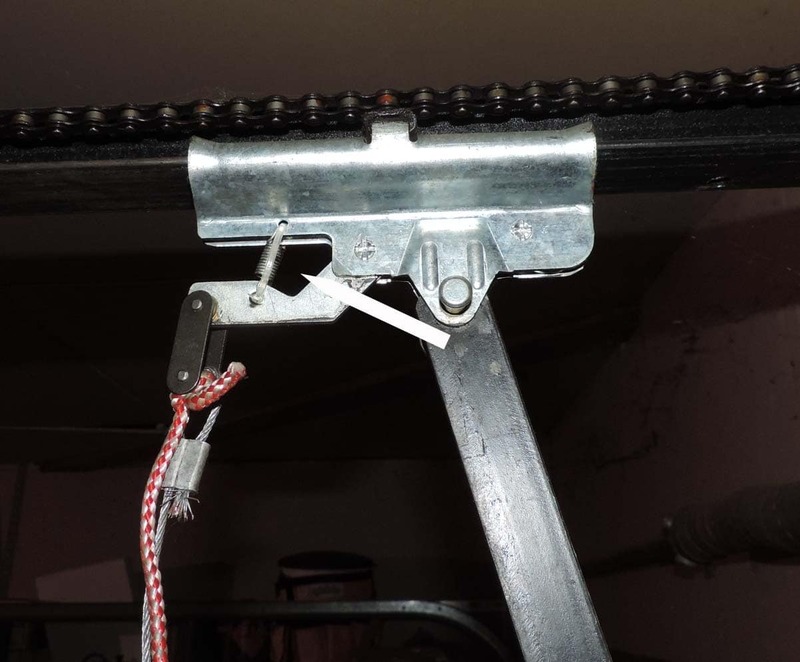 Take a small cable tie and secure the release as shown in the attached picture. 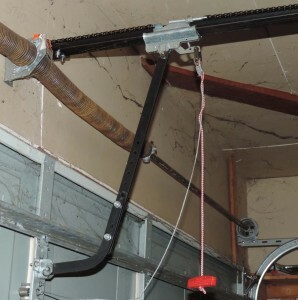 Another method of securing your garage doors is to take a look at the track that the overheard door rolls. Often you will see holes located directly about the rollers. You can stick a screw drive through these holes and this will disables the door. Just be sure the screwdriver is above the closest roller. Another simple trick, if you are going on vacation, unplug the garage door opener. This picture show a screwdriver inserted in the hole to lock the door from opening. The arrow points to the hole in the track. But none of these things matter if you don’t do your part. Securing your garage doors requires action on your part. Everyday I see garage doors that are left open to provide easy access for a burglar or even worst. Security starts with you. This entry was posted in security and tagged Securing your garage doors. Bookmark the permalink. When I leave the house for vacations I padlock a chain through the track for the garage door so it cannot be opened even if the thiefs got inside. I also unplug the garage door opener so it can’t be activated and cause damage because of the chained track. A person can also put a 1/4 in bolt & nut in the hole to prevent the opening of the door. The nut tightened to the bolt with the bolt sticking into the track, can’t be shaken out as the screwdriver in the picture. First off good luck getting a coat hanger hooked on the release. Second a screwdriver isn’t coming out easily. A lot of noise will be made trying to get it to wiggle loose. 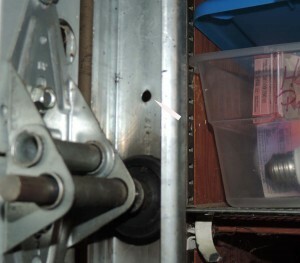 Go to the hardware store and buy a couple cheap c clamps and tighten them right above the rollers on each track. I’ve done this and the door will not open. Also have a dead bolt on the entry door to your house. If you don’t have c-clamps, a pair of vice grips on the track works well too. Video showing how this is done. I left the door opener unit unplugged during the winter for security and when I went to open the side door the deadbolt lock broke. It was one of the anti-bump stop ones where you can rekey the lock yourself. Apparently they easily get stuck easily. Had to get a locksmith and replace the lock – with an old school one. My brother told me that he’ll be needing a new garage door because their old garage door won’t close properly anymore. That is dangerous for their family’s safety because thieves and other criminals can easily barge in. 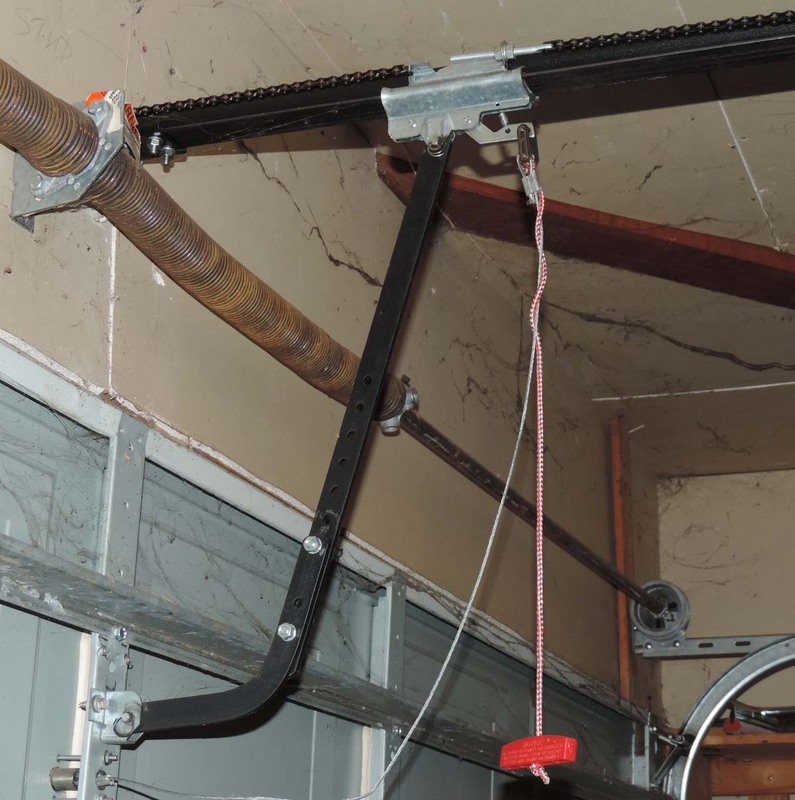 Like you said, it should be imperative that homeowners do everything they can to secure their garage doors because there are lots of cases that houses can be easily be accessed by burglars. Thanks!